As part of Varamahalakshmi festival today, Sri Chamundeshwari Temple on Chamundeshwari Street at Srirangapatna has been decorated with Rs. 2,000, Rs. 500, Rs. 100, Rs. 50, Rs. 20, Rs. 10 and Rs. 5 currency notes totalling Rs. 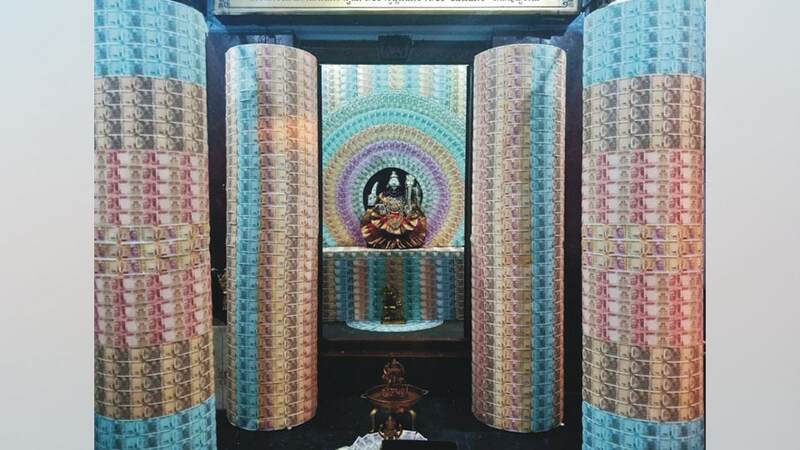 5 lakh which were given by devotees for decoration purpose. The decoration was done by Temple Priest Lakshmeesh. Special puja to the idol of Goddess Chamundeshwari was performed and later, prasadam was distributed to the devotees.